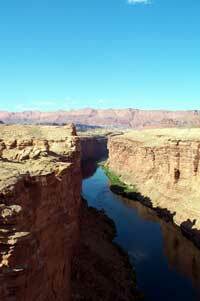 "I was very interested in Mark's pictures of Navajo Bridge because way before the (Glen Canyon) dam was built that now forms Lake Powell, I went down the river with Norman Nevills in a small wooden boat (without wearing a life preserver!) and he first flew over the route in his airplane to check out the flood conditions in the river. 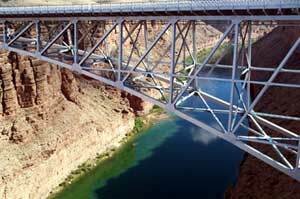 We landed at Navajo Bridge and he asked me if I would like to fly under it with him! It sounded like a great adventure and my father happened to be along and I happened to have TWO movie cameras with me. My father stood on the bridge and photographed Norman and I flying under the bridge, while I photographed the flight from inside the plane through the windshield! It makes an amazing sequence in my movie of the river trip!" Chuck Bausback is the principal researcher for the Huell Howser TV show "California Gold," a long-running roadtrip program that airs on the PBS network on the west coast. Mr. Bausback's aerial escapade happened in 1946. 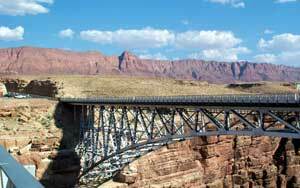 "I was amazed to read Chuck Bausback's account (at left) of flying under the Navajo Bridge. My Dad told a similar story, back in the 40's he also flew under the bridge! He was in a group - I think there were three planes - and all three flew under the bridge. I have always assumed that they were the only ones who had ever done that, so I was surprised to read Chuck's account. Now, I'm wondering if it was something that a lot of fliers did back then? Maybe it was a status thing to be able to say you flew under the Navajo Bridge? Dad remembers seeing people on the bridge taking pictures as he flew under it, so somewhere out there someone has pictures of his daredevil flight. He told me that as he flew down the narrow canyon and was approaching the bridge, he looked at it and thought to himself that he was never going to make it, the plane was going to touch the canyon walls and crash, but he was committed, it was too late to abort the flight, and luckily he made it through. Wesley Shreeve (my dad) and Darwin Grant were two of the three fliers who were in Dad's party. I wonder how many people there are out there who have flown under the bridge?"